The eight annual (2014) China-Hangzhou Cultural Creative Industry exhibition will open. Changmingsi Lane Community, Xiaoying Sub-district, Shangcheng District held activities to celebrate the Dragon Boat Festival yesterday. 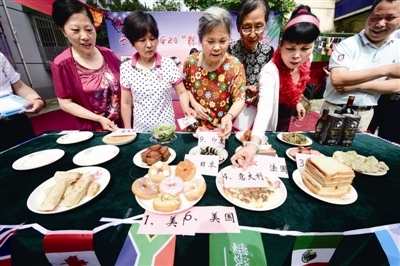 Residents were invited to enjoy exotic flavors by recognizing and tasting over 20 kinds of featured food from G20 member countries.